How long has The 400 Market been in business and was the building before? The 400 Market started the summer of 1986 and the building was built specifically for our purpose and our growing number of retailers has led to three expansions to our original building making us 102,000 square feet of retail space. We often get asked this as some of our customers are under the impression that we close during the winter months but The 400 Market is open every Saturday and Sunday year round. Roadshow Antique Mall operates from our lower area and is open 7 days a week from 10:00 to 5:30, but once again the traditional Market is only open weekends. How many retailers are there? 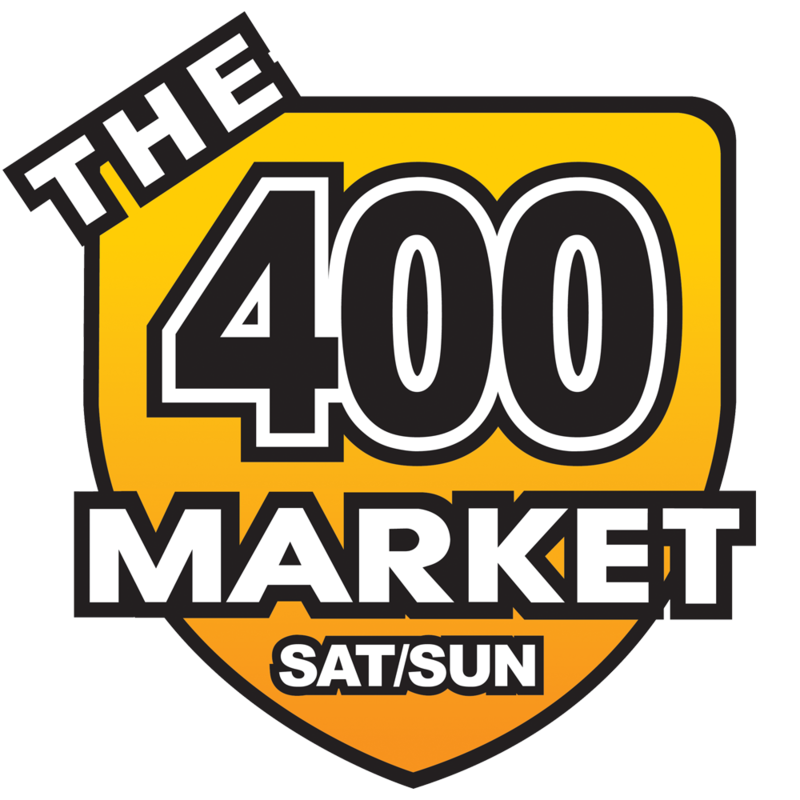 The 400 Market has a number of retailers that have expanded their businesses to multiple booths but there are 356 individual spots and 275 individual retailers with another 50 outside weather permitting. Roadshow Antique Mall has an additional 200 making The 400 Market on of the largest Market in Ontario with over 500 retailers that also is one of the largest employers in Simcoe County with as many as 1,000 people working at the Market each weekend. Why don’t you open holiday Monday’s or 7 days a week? The 400 Market would love to offer more hours of shopping but we only operate on weekends to keep our prices the lowest possible for our customers. Each of the businesses at the Market are operated by the owner of the business and if we expanded our hours of operation to 7 days a week from 9am to 9 pm that would require numerous staff which would increase the cost of operating a business at the Market that would then ultimately be put to end purchaser “YOU”. We never change our hours for holiday Monday’s as it’s the only one day that retailers get to spend with their families as the majority work during the week at other jobs and work every weekend year-round. Why do I have to pay sales tax at The 400 Market? When Flea Markets first started the majority of them sold used items like household appliances, car parts, hubcaps and used clothing similar to what you would find at garage sales today. The 400 Market is not what Flea Market were originally, the sophistication of the product and our retailers have changed over the years to include new products from around the world as you find in most of the larger retail chains. Even crafters and unique handmade items fall under the Ontario Sales practice regulations requiring all item to include sales tax, many retailers will state an advertised items as $10 no tax but that only means they included the tax to make it $10 even with tax. What if I want to return an item I’ve purchased? Why shop at The 400 Market? It is hard to say what the main reason is as the variety of items and retailers are second to none. Maybe it’s our prices as our low overhead makes The 400 Market very unique. A diamond engagement ring is much more affordable than you would find when comparing the exact same ring anywhere else. The 400 Market takes great pride in its retailers and what it offers to our customers, so when asked; Why shop at The 400 Market? Simply put it’s because we love having you as a customer and appreciate your support of local businesses in your community that creates what is to be considered a unique fun and friendly way to spend a day with friends and family all while saving you money.